Inspire true harmony within your body, mind & soul at The HideawayTM located in the picturesque Marriott Marquis & Marina in beautiful Downtown San Diego. Exclusive access to The Hideaway via the North Tower's mezzanine floor stimulates a feeling of reprieve from the din of America's Finest City. Explore our wide selection of wellness services that will invigorate and revitalize your senses. The Hideaway's four intimate treatment rooms provide for exquisite massage, facial & body treatments. Our wellness professionals are chosen for elegance of spirit and excellence in service and will revitalize your body & soul. Treatments include locally-sourced organic tea & infused water and customized aromatherapy. The HideawayTM proudly features Yon-Ka skin products and Doterra beyond organic essential oils and are hand-tailored for every luxurious treatment to increase harmony between Mind & Body. 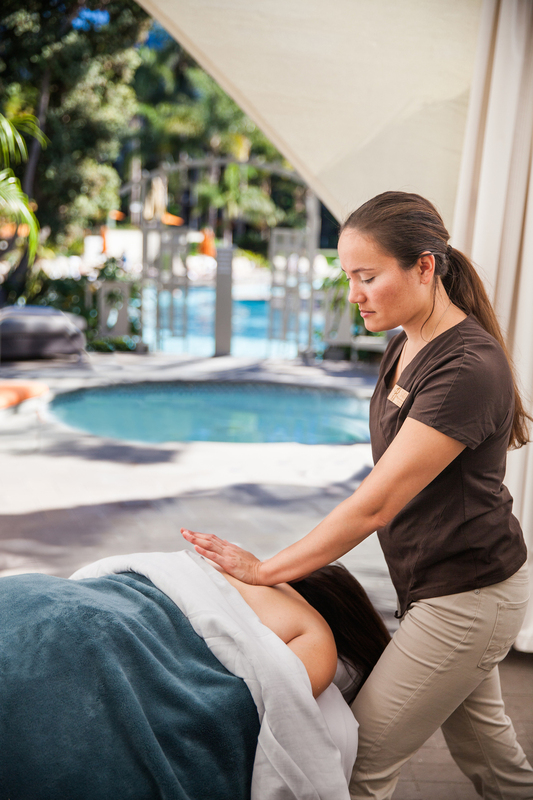 Poolside Cabana Massage is available seasonally, great for couples and groups! Learn more about our Exquisite Event Services. To assure full selection of service please book as far in advance as possible, two weeks in advance is highly recommended for weekend appointments. If you are celebrating a special occasion please let us know at time of booking. Guests must be at least 18 years of age to receive treatment; please inquire with our reservation team prior to booking if you are interested in pre-natal services. Promotional offers are not valid on packages, same day or series. The Hideaway has a 24 hour cancellation policy. To avoid charges, please notify The Hideaway by calling 619.230.8963 if you wish to reschedule or cancel; cancellations made less than 2 hours prior to scheduled service time will incur a cancellation fee of $50 and all no-shows will be charged the full service amount. Please arrive a minimum of 10 minutes (15 minutes preferred) before treatment time to complete initial consultation, allow our therapists to properly introduce themselves and enjoy tea service. Late arrival may result in shortened treatment; guest is responsible for full treatment price. A credit card is required to be placed on hold in order to make a reservation for any of the services provided at The HideawayTM . An authorized room charge or credit card are required prior to start of service (please bring with you a valid credit card or photo ID to confirm room charge). Large parties may require a deposit and may be subject to contractual agreement. The HideawayTM proudly accepts all major US-based Credit Cards including Visa, Mastercard, American Express, and Discover. Gratuity can be charged to the credit card on file. Those wishing to tip in cash may do so at the end of the treatment. Amount should reflect level of satisfaction with treatment. A recommended gratuity amount is 20%-24% of total service price. If at any point in your treatment you need adjusting in positioning, pressure, temperature, draping, music level please don’t hesitate to let your technician know. All appropriate requests will be met. Locked storage is not available in The Hideaway, though access to fitness center lockers may be made available upon advanced notice. It is recommended that any items of value are not brought to the facility as we cannot guarantee its safety. Any behavior perceived as inappropriate or sexual in any way will result in immediate termination of service and a full charge of the original requested service. Marriott Security staff will be notified. Gift Certificates are available online or in-person and can be sent to a designated location. Promotional value may expire but dollar amount will always be valid. Click Here to purchase digital and print-at-home gift certificates.